Those tips or "punte" in Italian are what gives this plant its name. 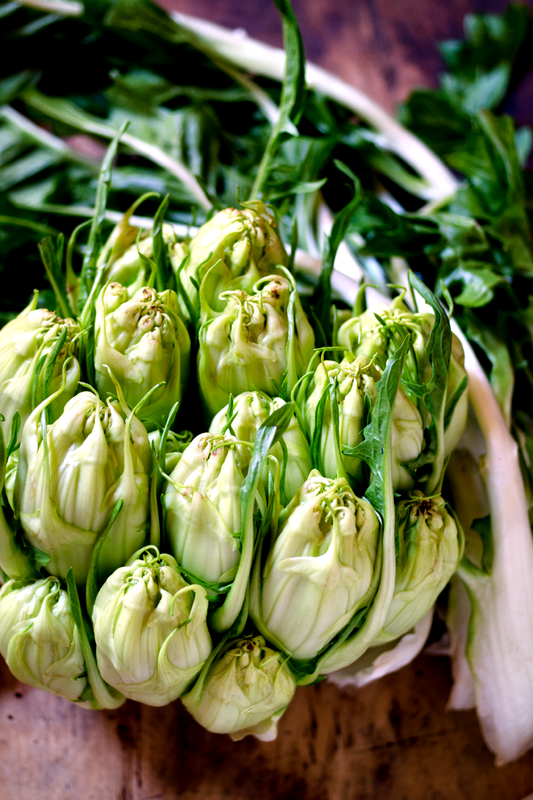 The traditional Roman way of serving these are to finely julienne the tips and serve them tossed with a garlic anchovy dressing. The outer leaves don't get thrown away - sauté them with garlic and chili and a decent dose of olive oil for a quick and easy side dish. The dish I've made a bit of an amalgam - I'll be using that typical Roman dressing and serving the puntarelle on a bruschetta. 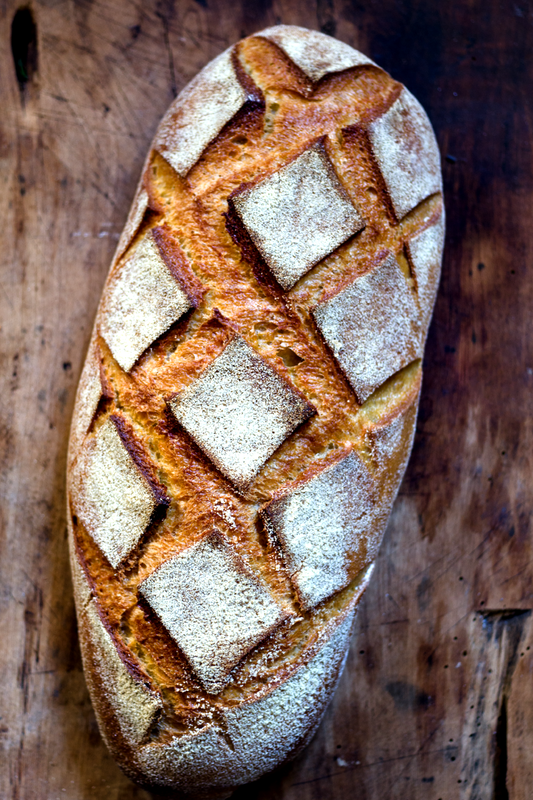 Bruschetta live and die on the quality of the bread so for this dish I'm using this beautiful Alta Mura loaf made from one of my favourite local bakers, Il Forno di Marco Bosio. 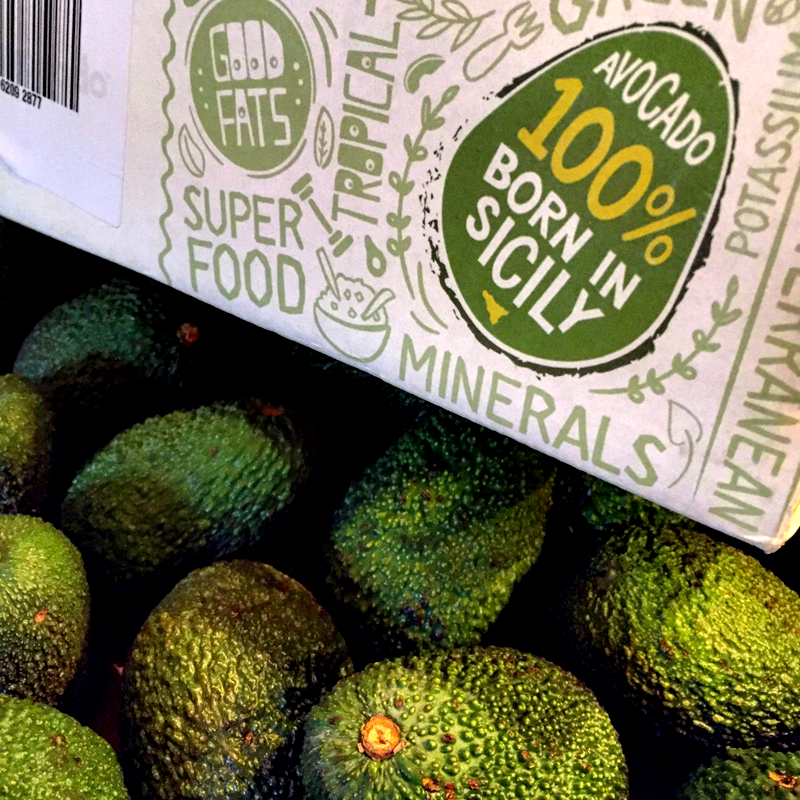 We are lucky in Australia when it comes to finding locally grown avocado - here in Italy, it's a different situation. Usually, you would have to make do with ones that have come from Israel or South America but as I only recently discovered, they are being grown in Sicily - and what is even better is that they will ship them to your door! This is my second box and they are excellent. If you are Italy and love avocado then I can highly recommend them (here is the link to the green stuff). I've used avocado because their creaminess just works with the crispness of the punterelle and is a wonderful foil to that garlic and anchovy dressing. Only use the tips and to get a very fine slice, a mandolin comes in handy. depending on the size of the tips you can slice them in half lenghtways and use a peeler to slice into ribbons. Once sliced place them in a bowl of ice cold water and let them sit for about half an hour. Using a mortar and pestle, place a cleaned garlic clove in the mortar along with a pinch of coarse sea salt - the salt helps to break down the garlic. Pound until smooth. Add 1 or 2 anchovies (depends on the strength of the anchovy) and pound again to mash the anchovy. Follow with a little vinegar (or lemon juice) and a tablespoon of olive oil. Continue working until amalgamated - it doesn't need to be perfectly smooth. 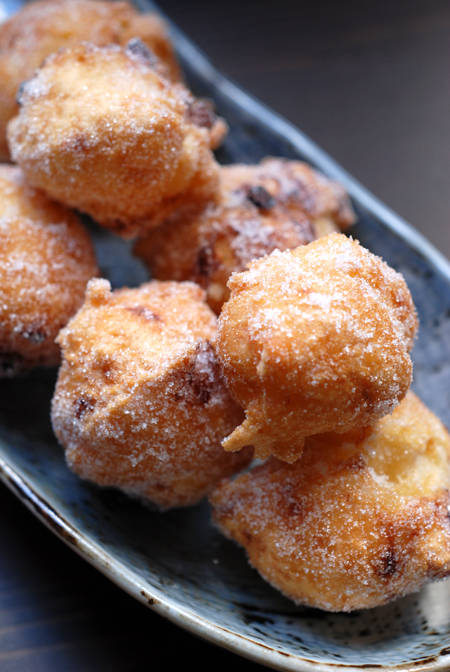 Taste and adjust with vinegar and olive oil. Whisk until emulsified. Lightly toast the bread until just warmed through. Drain the Puntarelle and pat dry - place in a bowl and drizzle over with dressing. Toss until evenly coated. 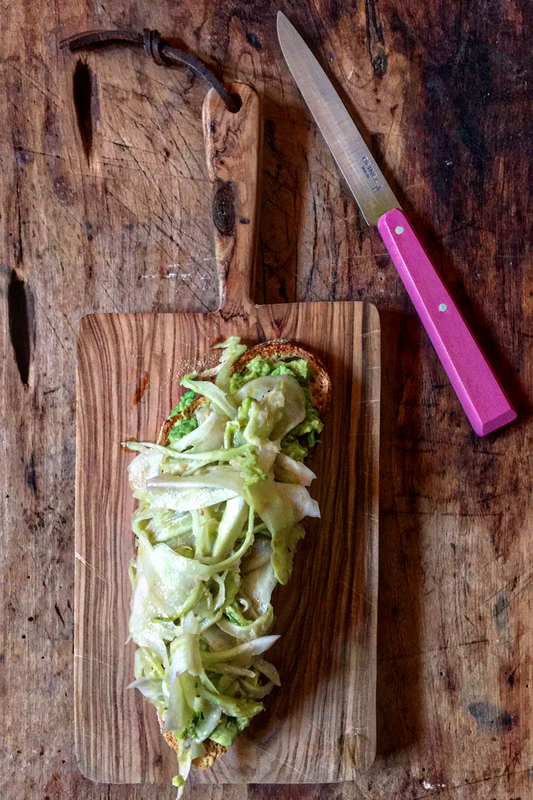 Take the warm bread, cover generously with the smashed avocado and top with the dressed Puntarelle. If you like, finish with a little freshly ground pepper. 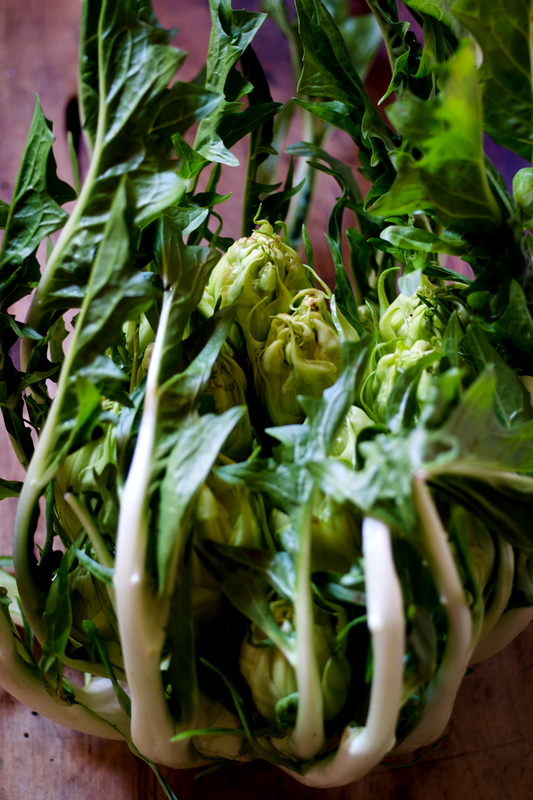 Had no idea that puntarelle is so delicious and at the same time so simple!